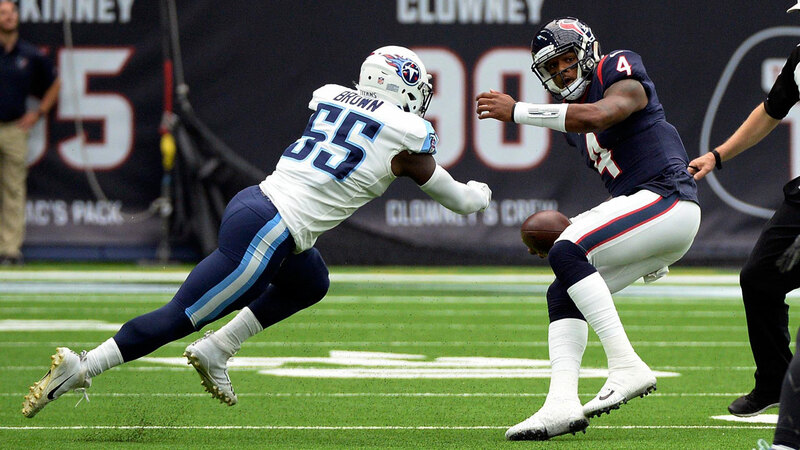 HOUSTON, Texans (KTRK) -- Rookie Deshaun Watson shined, throwing for four touchdowns and running for another as the Houston Texans scored the most points in franchise history in 57-14 walloping of the Tennessee Titans on Sunday. Watson, the 12th pick in this year's draft, became the first rookie to throw four touchdowns and run for another one since Fran Tarkenton in 1961 and tied an NFL record for most TDs by a rookie quarterback. The Texans (2-2) outdid their previous highest point total of 45 set in a victory over the Titans in 2014 and are the first NFL team to score 50 points since the Jaguars scored 51 in December 2015. Houston's defense got things going when Andre Hal intercepted Marcus Mariota on the game's third play. It was the first of four interceptions for Houston's defense. Mariota, who became the first Titans quarterback with two rushing touchdowns in a game since Steve McNair in 2003, injured his hamstring and didn't play after halftime. Matt Cassel took over for the Titans (2-2) and threw for 21 yards with two interceptions. Watson then led Houston's offense to touchdowns on three straight possessions for a 21-0 lead early in the second quarter. It was the first time since Oct. 19, 2008 that Houston scored a touchdown on each of its first three possessions. The first score came on a 2-yard run by Lamar Miller. Watson then found DeAndre Hopkins on an 8-yard pass before connecting with Will Fuller on a 16-yarder. Mariota had touchdown runs of 34 and 2 yards in the second quarter sandwiched around a field goal by Houston to cut the lead to 24-14. But Watson's 1-yard touchdown scamper pushed Houston's lead to 30-14 at halftime after the kick failed. Ka'imi Fairbairn made a 40-yard field goal to extend the lead to 47-14.